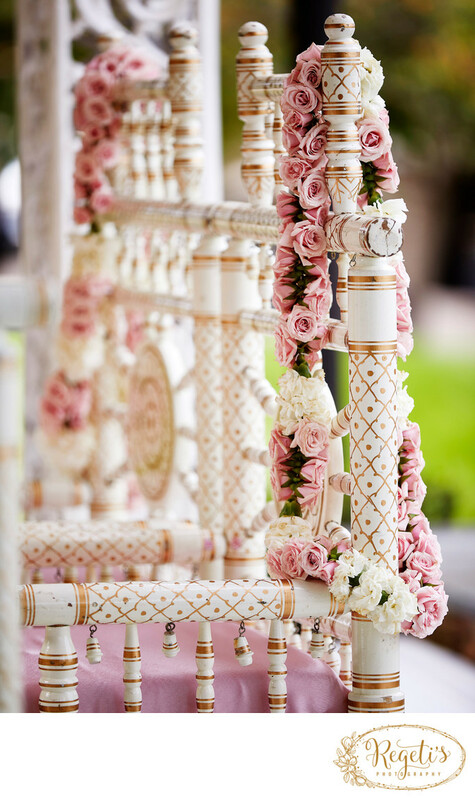 Cream carnations and blush petite roses lushly completed these Hindu wedding garlands adorning the beautiful ornate chairs present under the mandap of this Indian wedding ceremony setup at the picturesque setting of the Lansdowne Resort and Spa outdoor space. Location: Lansdowne Resort and Spa, 44050 Woodridge Parkway Leesburg, VA 20176. Keywords: Hindu Wedding Garlands (3), Indian Wedding (9), Lansdowne Resort and Spa (3).